Earlier this month, I went on a Caribbean cruise for the first time in 7 years. Our itinerary on the Carnival Legend was the "Exotic Western Caribbean." I picked it because it included two new ports (and countries) for me. Once you pick your itinerary, it's time to start pondering what you want to do at each port of call. The cruise lines are more than ready to help you out with that. You can look through their activity catalog, book online and drop hundreds of dollars real quick. For a first time cruiser, selecting shore excursions through the cruise line may be a good choice, especially if you're new to international travel. The cruise line will hold your hand through the whole process: gathering you in the lounge, herding you to the tender or pier, getting you on to your bus and guaranteeing that the ship won't leave without you. However, the cruise lines do not have to be your only source for planning your time in port. Do a little research, just like you would for any place you go on vacation. Find out what are the must-sees / must-dos, read some reviews (cruise website, cruise critic, trip advisor, etc), and look at other ways that you can book your adventure. Supporting the local economy: In a lot of these ports, the ships really do drive the economy. The day we were in Grand Cayman, we were the only ship there. One of the shopkeepers told me in the peak season in January there can be 7-8 ships a day. Crazy! Some ports of call are actually built by the cruise lines, so the shops closest to the ships may be owned by the cruise line and the prices are more likely to be fixed. If you're willing to walk a little farther, or take a cab to the closest "real" town or village, you will probably see a little more of real life and spend your dollars in a way that can really benefit local people in a developing nation. As long as you fun and get back to the ship on time for the sail away jams, you're doing just fine. Our ship docked in "Puerta Maya." This development was built just for the cruise lines. It's very clean, colorful, and has all the traditional Mexican souvenirs with the price tags attached. You might be able to bargain a little in a some of the shops, but in reality, it's a controlled shopping area for cruise ship passengers only. When the ship departs, the shops and restaurants close down and the employees go home. There is a huge taxi stand outside and the fares are pretty much fixed if you want to go to one of the beaches or elsewhere on the island. We walked across the street and hit up a few of the shops there - prices were very reasonable, you could definitely negotiate, and I was able to have ice cream and an agua fresca. You know you're having a good time bargaining when the shop keeper says, "Jenni, don't break my heart." Sometimes booking your excursion through the cruise line has its benefits. In Belize, all the cruise ships have to stay out in the water and passengers tender in. My friend and I did the snorkeling and a visit to Bannister Island. The catamaran picked us up right from the ship and headed straight to the reef. We snorkeled for an hour in a beautiful section of the reef, then enjoyed some rum punch on our way to this little tiny island for some sun. We even saw some dolphins swimming by our catamaran. Included in our stop at this island were the beach chairs, water floats and kayaks. If you wanted to eat or drink on the island, you needed to pay additional. After an hour or so of relaxing in the sun, it was time to head back to the ship. We decided to take a tender into the port, just to see it. We didn't have much time, and it was the standard souvenir shops and lots of jewelry stores. I talked to some other passengers later and they said that if you left the area right by the pier and went outside the "fence" you can definitely tell that Belize is still developing and that the shopkeepers really wanted your business. Roatan is an island off the coast of Honduras. It is beautiful, green and very lush. Carnival paid $65 million (or so), so develop Mahogany Bay, which is where they dock on Roatan. It's a complete development: shops, restaurants, beach and even a chair lift. Yes, a chair lift. Living in Colorado, the idea of riding a lift in my swimsuit instead of my ski gear makes me laugh. But you can pay to ride this lift to the beach - rather than walking for 5 minutes. Something I did like in this little development was a chance to get my passport stamp. The local Rotary club takes donations to help provide plumbing and toilets for schools and in return you can get a stamp. What a great fundraising opportunity! I wanted to go zip-lining and started to research options other than the zip line tour that Carnival provided. I booked a "Zip and Dip" from Viator for about $30 less than Carnival's price. There are other third party shore excursion providers and many of them will also offer "return to the ship" guarantees if you're worried that they will sail away without you. The zip line provider was South Shore Zip Line and they were fantastic. I would definitely recommend them. We got a bit of an island tour on our way to the zip line and their facility has something like 13-15 lines so it lasts for quite a while. All the guides were great - they would ride tandem with anyone who was nervous, or encourage you to hang upside down if you weren't nervous. It was pouring rain during part of our trip, but hell, you're in a rain forest anyway. I would say that this was the most fun I've had in the pouring rain. I'm glad I wasn't wearing makeup - some of the other ladies in our group had raccoon eyes from their dripping mascara. After our zip line, we were scheduled to hit the beach. Since it was cooler and we were all wet, no one really wanted to swim, but we had some rum punch and a chance to pick up some small souvenirs along the beach. On our way back to Mahogany Bay we drove through the main town and where the other cruise ships dock - if I would have had more time, I would have liked to explore that area. On my last (and only) visit to Grand Cayman, I went to Stingray City, so this time, I wasn't really interested in an organized shore excursion. I just wanted to lie on the beach. Now the cruise line offers a variety of beach excursions costing about $40 or more for an air-conditioned bus to private beach clubs - depending on how much you want to pay, you could get a beach chair or lunch included. However, there are tons of shared vans/taxis that have set pricing (between $4-7 each way) to take you to a variety of stops on the famous 7 Mile Beach. We paid $4 and went to the first stop, the Royal Palms. The $2 access fee gets you access to their showers and bathrooms. They also have a beach side restaurant and my mahi mahi sandwich was great. I didn't need a beach lounger. The sand was just fine. I had time to get some rum cakes in port before heading back to the ship. The annual Pirates Week festival was starting the night we departed Grand Cayman. One of the storekeepers told me that as soon as the ship departed everyone would go home, get changed and come back for the fireworks that kick off the celebration. So there you have it. 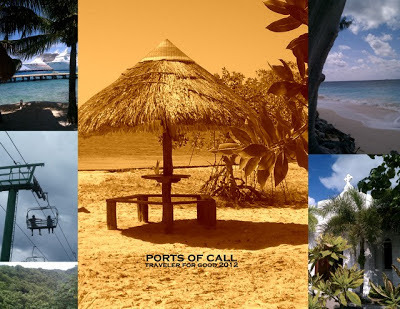 My take on my shore excursions, or lack thereof, at these ports of call. If you've been on a cruise, what was your favorite port and/or activity?